Eye exams are generally recommended yearly to monitor your eye health. 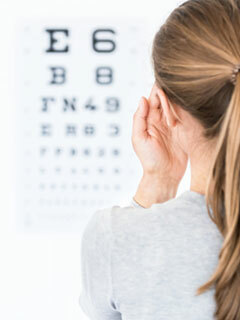 For some special conditions, eye exams may be needed more frequently. Children should have their first eye exam by age 3 or earlier if symptoms are noticed. Our doctors recommend the optomap retinal exam for all of our patients. We offers a wide range of contact lens materials and replacement schedules for patients who want to experience the many advantages of wearing contact lenses. Daily, extended and continuous wear contact lenses are all available. In addition, we offer special contact lens designs for astigmatism, bifocals, cosmetics, sports, etc. We offer the most up to date lens materials including silicone hydrogel known for it’s enhanced breath-ability and materials for dry eye patients. Sports tints are also available for both the serious and occasional athlete. Our doctors are trained and licensed to detect eye disease and prescribe medications for the eye. If you have a medical eye problem, please inform the receptionist when you call. We see patients with urgent eye problems immediately. The Optical Dispensary offers eyewear for the entire family. We have an extensive selection of frames by several top designers for both adults and children. Eyewear by Gucci, Kate Spade, Lacoste, and Oakley just to name a few, are available in a variety of shapes and colors. Our professional and experienced staff can provide you with all of your eyewear needs. Vision Therapy, also called Vision Training, is an individual program of eye training procedures used to improve or correct certain vision problems. It involves a series of treatments during which carefully planned procedures are carried out by the patient under professional supervision in order to improve vision skills such as eye movement control, eye focusing and coordination, and the teamwork of the two eyes. To increase functional vision skills and sensory motor performance, individuals are evaluated and participate in therapy customized by Dr. Steven J. Curtis , O.D., FCOVD, and Shelley Ullom, MOT, OTR/L. Neuro-Optometric Rehabilitation is a therapy which utilizes optometric vision therapy, prisms, lenses, filters and occlusion to help stimulate parts of the brain which are not functioning to their highest potential, due to interruptions caused by brain injury. Brain injury from concussion, stroke, birth trauma (ADD/ADHD), physical trauma, can be treated with Neuro-Optometric Rehabilitation. Sports vision training works on improving the visual abilities of an athlete that are most necessary for excellence in their sport. Dr Steven Curtis provides sports vision training to high school, college and professional atheletes, including some from the Columbus Blue Jackets and the Columbus Crew.